We custom design all of our own floor plans. So whether our clients want to semi custom design from our existing pre-designed plans or start from scratch, we make every home unique for the owner. Contact us to start your new home design. Recognized as an industry leader in efficient construction methods, John Cotner realizes that the cost of energy consumption is not decreasing. It is important that every home utilize passive-solar design techniques along with the use of the best materials for the most energy efficient homes on the market. Having been recognized as the Energy Star Builder of the Year for Idaho, Cotner Building Company understands that the things you can't see can hurt you. Let us educate you on what processes we use to make your home healthy, comfy and less expensive to live in. We believe in continuing education and designing relevant homes. This is one reason Cotner Building Company is the only certified Aging-In-Place (CAPS)home design specialist in Idaho. 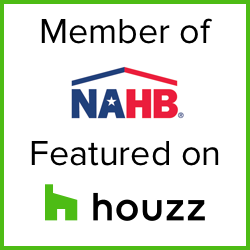 Certified through the National Association of Home Builders, John Cotner knows how to design specialty adaptive homes that meet the needs of many generations. Whether looking to stay in your home through retirement or caring for a loved one, our homes are designed with your needs in mind.